The Irish Rebellion of 1798 (Irish: Éirí Amach 1798) was an uprising against British rule in Ireland. The United Irishmen, a republican revolutionary group influenced by the ideas of the American and French revolutions, were the main organising force behind the rebellion, led by Presbyterians angry at being shut out of power by the Anglican establishment and joined by Catholics, who made up the majority of the population. Many Ulster Protestants sided with the British, resulting in the conflict taking on the appearance of a sectarian civil war in many areas, with atrocities on both sides. A French army which landed in County Mayo in support of the rebels was overwhelmed by British and loyalist forces. The uprising was suppressed by British Crown forces with a death toll of between 10,000 and 30,000. Wolfe Tone, United Irish leader. Since 1691 and the end of the Williamite War, Ireland had chiefly been controlled by the minority Anglican Protestant Ascendancy constituting members of the established Church of Ireland loyal to the British Crown. It governed through a form of institutionalised sectarianism codified in the Penal Laws which discriminated against both the majority Irish Catholic population and Dissenters (non-Anglican Protestants, e.g. Presbyterians). In the late 18th century, liberal elements among the ruling class were inspired by the example of the American Revolution (1765–1783) and sought to form common cause with the Catholic populace to achieve reform and greater autonomy from Britain. As in England, the majority of Protestants, as well as all Catholics, were barred from voting because they did not pass a property threshold. Despite Ireland nominally being a sovereign kingdom governed by the monarch and Parliament of the island, due to a series of laws enacted by the English, such as Poynings' law of 1494 and the Declaratory Act of 1719 (the former of which gave the English veto power over Irish legislation, and the latter of which gave the British the right to legislate for the kingdom),  Ireland in reality had less independence than most of Britain's North American colonies, adding to the list of grievances. When France joined the Americans in support of their Revolutionary War, London called for volunteers to join militias to defend Ireland against the threat of invasion from France (since regular British forces had been dispatched to America). Many thousands joined the Irish Volunteers. In 1782 they used their newly powerful position to force the Crown to grant the landed Ascendancy self-rule and a more independent parliament ("Grattan's Parliament"). The Irish Patriot Party, led by Henry Grattan, pushed for greater enfranchisement. In 1793 Parliament passed laws allowing Catholics with some property to vote, but they could neither be elected nor appointed as state officials. Liberal elements of the Ascendancy seeking a greater franchise for the people, and an end to religious discrimination, were further inspired by the French Revolution, which had taken place in a Catholic country. The prospect of reform inspired a small group of Protestant liberals in Belfast to found the Society of United Irishmen in 1791. The organisation crossed the religious divide with a membership comprising Roman Catholics, Presbyterians, Methodists, other Protestant "dissenters" groups, and some from the Protestant Ascendancy. The Society openly put forward policies of further democratic reforms and Catholic emancipation, reforms which the Irish Parliament had partially but reluctantly granted in 1793. The outbreak of war with France earlier in 1793, following the execution of Louis XVI, forced the Society underground and toward armed insurrection with French aid. The avowed intent of the United Irishmen was to "break the connection with England"; the organisation spread throughout Ireland and had at least 200,000 members by 1797. However, only a small proportion of them took part in the 1798 rebellion, suggesting that most members supported its aims, but not to the extent of violence unless provoked. 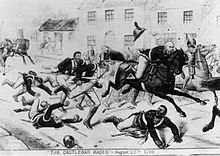 It linked up with Catholic agrarian resistance groups, known as the Defenders, who had started raiding houses for arms in early 1793. To augment their growing strength, the United Irish leadership decided to seek military help from the French revolutionary government and to postpone the rising until French troops landed in Ireland. Theobald Wolfe Tone, leader of the United Irishmen, travelled in exile from the United States to France in 1796 to press the case for intervention. By this stage the dominant Roman Catholic Hierarchy was totally opposed to the United Irish, having seen the results of the "Dechristianization" policy in France since 1789, and this led to a reduction of support. In 1796–97 the French armies had opposed the Papacy in Italy, and in February 1798 the French republican system set up a short-lived "Roman Republic". The hierarchy was naturally concerned that a republican rebellion led mostly by protestant nationalists, would, if successful, be governed as yet another "Sister republic" of France. Tone's efforts succeeded with the dispatch of the Expédition d'Irlande, and he accompanied a force of 14,000 French veteran troops under General Hoche which arrived off the coast of Ireland at Bantry Bay in December 1796 after eluding the Royal Navy; however, unremitting storms, indecisiveness of leaders and poor seamanship all combined to prevent a landing. The despairing Wolfe Tone remarked, "England has had its luckiest escape since the Armada." The French fleet was forced to return home and the veteran army intended to spearhead the invasion of Ireland split up and was sent to fight in other theatres of the French Revolutionary Wars. The Establishment responded to widespread disorder by launching a counter-campaign of martial law from 2 March 1797. It used tactics including house burnings, torture of captives, pitchcapping and murder, particularly in Ulster as it was the one area of Ireland where large numbers of Catholics and Protestants (mainly Presbyterians) had effected common cause. In May 1797 the military in Belfast also violently suppressed the newspaper of the United Irishmen, the Northern Star. Arrest of Lord Edward Fitzgerald (George Cruikshank). The British establishment recognised sectarianism as a divisive tool to employ against the Protestant United Irishmen in Ulster and the divide and conquer method of colonial dominion was officially encouraged by the Government. Brigadier-General C.E. Knox wrote to General Lake (who was responsible for Ulster): "I have arranged ... to increase the animosity between the Orangemen and the United Irishmen, or liberty men as they call themselves. Upon that animosity depends the safety of the centre counties of the North." Similarly, The Earl of Clare, the Lord Chancellor of Ireland, wrote to the Privy Council in June 1798, "In the North nothing will keep the rebels quiet but the conviction that where treason has broken out the rebellion is merely popish", expressing the hope that the Presbyterian republicans might not rise if they thought that rebellion was supported only by Catholics. Loyalists across Ireland had organised in support of the Government; many supplied recruits and vital local intelligence through the foundation of the Orange Order in 1795. The Government's founding of Maynooth College in the same year, and the French conquest of Rome earlier in 1798 both helped secure the opposition of the Roman Catholic Church to rebellion; with a few individual exceptions, the Church was firmly on the side of the Crown throughout the entire period of turmoil. In March 1798 intelligence from informants amongst the United Irish caused the Government to sweep up most of their leadership in raids in Dublin. Martial law was imposed over most of the country and its unrelenting brutality put the United Irish organisation under severe pressure to act before it was too late. A rising in Cahir, County Tipperary broke out in response, but was quickly crushed by the High Sheriff, Col. Thomas Judkin-Fitzgerald. Militants led by Samuel Neilson and Lord Edward FitzGerald with the help of co-conspirator Edmund Gallagher dominated the rump United Irish leadership and planned to rise without French aid, fixing the date for 23 May. The initial plan was to take Dublin, with the counties bordering Dublin to rise in support and prevent the arrival of reinforcements followed by the rest of the country who were to tie down other garrisons. The signal to rise was to be spread by the interception of the mail coaches from Dublin. However, last-minute intelligence from informants provided the Government with details of rebel assembly points in Dublin and a huge force of military occupied them barely one hour before rebels were to assemble. The Army then arrested most of the rebel leaders in the city. Deterred by the military, the gathering groups of rebels quickly dispersed, abandoning the intended rallying points, and dumping their weapons in the surrounding lanes. In addition, the plan to intercept the mail coaches miscarried, with only the Munster-bound coach halted at Johnstown, near Naas, on the first night of the rebellion. Although the planned nucleus of the rebellion had imploded, the surrounding districts of Dublin rose as planned and were swiftly followed by most of the counties surrounding Dublin. The first clashes of the rebellion took place just after dawn on 24 May. Fighting quickly spread throughout Leinster, with the heaviest fighting taking place in County Kildare where, despite the Army successfully beating off almost every rebel attack, the rebels gained control of much of the county as military forces in Kildare were ordered to withdraw to Naas for fear of their isolation and destruction as at Prosperous. However, rebel defeats at Carlow and the hill of Tara, County Meath, effectively ended the rebellion in those counties. In County Wicklow, news of the rising spread panic and fear among loyalists; they responded by massacring rebel suspects held in custody at Dunlavin Green and in Carnew. A baronet, Sir Edward Crosbie, was found guilty of leading the rebellion in Carlow and executed for treason. In County Wicklow, large numbers rose but chiefly engaged in a bloody rural guerrilla war with the military and loyalist forces. General Joseph Holt led up to 1,000 men in the Wicklow Mountains and forced the British to commit substantial forces to the area until his capitulation in October. In the north-east, mostly Presbyterian rebels led by Henry Joy McCracken rose in County Antrim on 6 June. They briefly held most of the county, but the rising there collapsed following defeat at Antrim town. In County Down, after initial success at Saintfield, rebels led by Henry Munro were defeated in the longest battle of the rebellion at Ballynahinch. The rebels had most success in the south-eastern county of Wexford where they seized control of the county, but a series of bloody defeats at the Battle of New Ross, Battle of Arklow, and the Battle of Bunclody prevented the effective spread of the rebellion beyond the county borders. 20,000 troops eventually poured into Wexford and defeated the rebels at the Battle of Vinegar Hill on 21 June. The dispersed rebels spread in two columns through the midlands, Kilkenny, and finally towards Ulster. The last remnants of these forces fought on until their final defeat on 14 July at the battles of Knightstown Bog, County Meath and Ballyboughal, County Dublin. On 22 August, nearly two months after the main uprisings had been defeated, about 1,000 French soldiers under General Humbert landed in the north-west of the country, at Kilcummin in County Mayo. Joined by up to 5,000 local rebels, they had some initial success, inflicting a humiliating defeat on the British in Castlebar (also known as the Castlebar races to commemorate the speed of the retreat) and setting up a short-lived "Irish Republic" with John Moore as president of one of its provinces, Connacht. This sparked some supportive uprisings in Longford and Westmeath which were quickly defeated, and the main force was defeated at the battle of Ballinamuck, in County Longford, on 8 September 1798. The Irish Republic had only lasted twelve days from its declaration of independence to its collapse. The French troops who surrendered were repatriated to France in exchange for British prisoners of war, but hundreds of the captured Irish rebels were executed. This episode of the 1798 Rebellion became a major event in the heritage and collective memory of the West of Ireland and was commonly known in Irish as Bliain na bhFrancach and in English as "The Year of the French". On 12 October 1798, a larger French force consisting of 3,000 men, and including Wolfe Tone himself, attempted to land in County Donegal near Lough Swilly. They were intercepted by a larger Royal Navy squadron, and finally surrendered after a three-hour battle without ever landing in Ireland. Wolfe Tone was tried by court-martial in Dublin and found guilty. He asked for death by firing squad, but when this was refused, Tone cheated the hangman by slitting his own throat in prison on 12 November, and died a week later. Small fragments of the great rebel armies of the Summer of 1798 survived for a number of years and waged a form of guerrilla or "fugitive" warfare in several counties. In County Wicklow, General Joseph Holt fought on until his negotiated surrender in Autumn 1798. It was not until the failure of Robert Emmet's rebellion in 1803 that the last organised rebel forces under Captain Michael Dwyer capitulated. Small pockets of rebel resistance had also survived within Wexford and the last rebel group under James Corcoran was not vanquished until February 1804. Religious, if not economic, discrimination against the Catholic majority was gradually abolished after the Act of Union but not before widespread mobilisation of the Catholic population under Daniel O'Connell. Discontent at grievances and resentment persisted but resistance to British rule now largely manifested itself along anti-taxation lines, as in the Tithe War of 1831–36. Nevertheless, this fostering or resurgence of religious division meant that Irish politics was largely, until the Young Ireland movement in the mid-19th century, steered away from the unifying vision of the egalitarian United Irishmen and based on sectarian fault lines with Unionist and Dublin Castle individuals at the helm of power in Ireland.After Robert Emmets rebellion of 1803 and the Act of Union Ulster Presbyterians and other dissenters were likely bought off by British/English Anglican ruling elites with industry ship building wollen mill and as the 19th century progressed they become less and less radical and Republican/Nationalist in outlook. Half-hanging of suspected United Irishmen by government troops. The aftermath of almost every British victory in the rising was marked by the massacre of captured and wounded rebels with some on a large scale such as at Carlow, New Ross, Ballinamuck and Killala. The British were responsible for particularly gruesome massacres at Gibbet Rath, New Ross and Enniscorthy, burning rebels alive in the latter two. For those rebels who were taken alive in the aftermath of battle, being regarded as traitors to the Crown, they were not treated as prisoners of war but were executed, usually by hanging. Local forces publicly executed suspected members of the United Irishmen without trial in Dunlavin in what is known as the Dunlavin Green Executions and in Carnew days after the outbreak of the rebellion. County Wexford was the only area which saw widespread atrocities by the rebels during the Wexford Rebellion. Massacres of loyalist prisoners took place at the Vinegar Hill camp and on Wexford bridge. After the defeat of a rebel attack at New Ross, the Scullabogue Barn Massacre occurred where between 80 and 200 mostly Protestant men, women, and children were imprisoned in a barn which was then set alight. In Wexford town, on 20 June some 70 loyalist prisoners were marched to the bridge (according to an unsourced claim by historian James Lydon, first stripped naked) and piked to death. Contemporary estimates put the death toll from 20,000 (Dublin Castle) to as many as 50,000 of which 2,000 were military and 1,000 loyalist civilians. Some modern research argues that these figures may be too high. Firstly, a list of British soldiers killed, compiled for a fund to aid the families of dead soldiers, listed just 530 names. Secondly, professor Louis Cullen, through an examination of depletion of the population in County Wexford between 1798 and 1820, put the fatalities in that county due to the rebellion at 6,000. Historian Thomas Bartlett therefore argues, "a death toll of 10,000 for the entire island would seem to be in order". Other modern historians believe that the death toll may be even higher than contemporary estimates suggest as the widespread fear of repression among relatives of slain rebels led to mass concealment of casualties. By the centenary of the Rebellion in 1898, conservative Irish nationalists and the Catholic Church would both claim that the United Irishmen had been fighting for "Faith and Fatherland", and this version of events is still, to some extent, the lasting popular memory of the rebellion. A series of popular "98 Clubs" were formed. At the bicentenary in 1998, the non-sectarian and democratic ideals of the Rebellion were emphasised in official commemorations, reflecting the desire for reconciliation at the time of the Good Friday Agreement which was hoped would end "The Troubles" in Northern Ireland. The popular Irish ballad The Rising of the Moon recounts the loss of the United Irishmen. Written as early as the 1860s, the song has been since performed by many musicians, including The Dubliners. ^ The 1798 Irish Rebellion (BBC). ^ Lecky, William Edward Hartpole. A History of England in the Eighteenth Century, Volume VII. D. Appleton And Company, New York, 1890, p. 312. ^ R. B. McDowell, Ireland in the Age of Imperialism and Revolution, 1760–1801 (1991) pp 612–36. ^ "Henry Joy McCracken – United irishman". Ulsterhistory.co.uk. Archived from the original on 4 February 2012. Retrieved 7 March 2012. ^ Guy Beiner (2018). Forgetful Remembrance: Social Forgetting and Vernacular Historiography of a Rebellion in Ulster. Oxford University Press. ISBN 9780198749356. ^ Daniel Gahan (1995). The People's Rising: The Great Wexford Rebellion of 1798. Gill Books. ISBN 9780717159154. ^ Guy Beiner, Remembering the Year of the French: Irish Folk History and Social Memory (University of Wisconsin Press, 2007). ^ Guy Beiner, "Severed Heads and Floggings: The Undermining of Oblivion in Ulster in the Aftermath of 1798" in The Body in Pain in Irish Literature and Culture, edited by Fionnuala Dillane, Naomi McAreavey and Emilie Pine (Palgrave Macmillan, 2016), pp. 77–97. ^ Musgrave, Sir Richard (1802). Memoirs of the different rebellions in Ireland (third ed.). Dublin. p. 17. Retrieved 8 September 2015. ^ Waltz, Robert B.; Engle, David G. "Rising of the Moon, The". The Traditional Ballad Index. California State University, Fresno. Retrieved 21 October 2010. Ingham, George R. Irish Rebel, American Patriot: William James Macneven, 1763–1841, Seattle, WA: Amazon Books, 2015. McDowell, R. B. Ireland in the Age of Imperialism and Revolution, 1760–1801 (1991) pp 595–651. Todd, Janet M. Rebel daughters: Ireland in conflict 1798 (Viking, 2003). 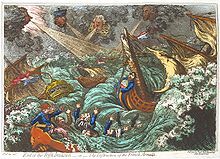 Wikimedia Commons has media related to Irish Rebellion of 1798.